Watch the following video to learn how to use the embedded integration method to embed your form on your website. 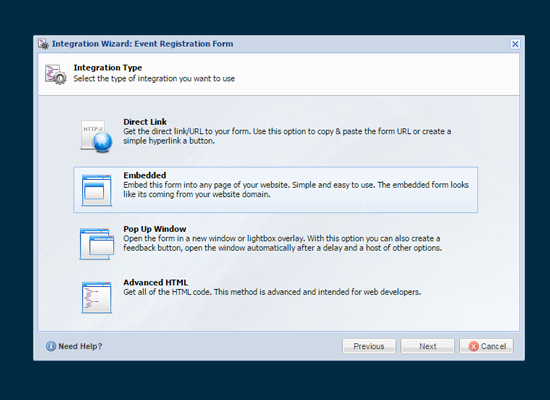 From within the Form Designer, click Integration in the toolbar. The Integration Wizard window displays. Choose Embedded, then click the Next button. The Embedded option generates a few lines of code that can be added to any page on your website. Select Dynamic Embedding, then click the Next button. The Dynamic Embedding option makes sure that the embedded frame automatically updates to accommodate your form. Keep the default values for the General Settings and click the Next button. The Embedded Integration code is now ready for you to copy and paste onto your website! You can also click Preview on this screen to see how the embedded form will look on a sample website. Select the code, then press <CTRL+C> to copy the code to your clipboard. Paste the code onto a web page, or send it to your company's Webmaster, or other responsible party. Be sure to test the website page with your new form and see if you need to make any changes to the integration code. If you do need to make some changes, come back to the Integration Wizard, adjust the settings, and click the Next to generate new HTML code for your form.